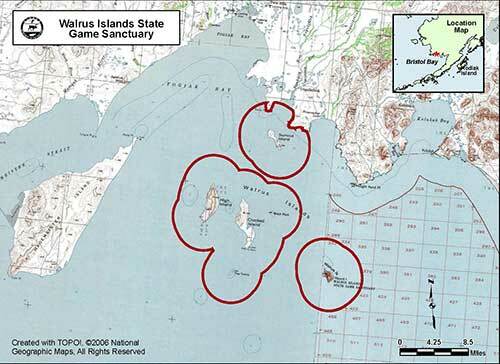 The Walrus Islands State Game Sanctuary (WISGS) and the Round Island camp is generally accessed by boat through the village of Togiak, Alaska or in some cases, Dillingham, Alaska. Commercial air transportation from Anchorage to Dillingham and Togiak is provided by several scheduled airlines with several flights daily throughout the summer. Dillingham: The Dillingham airport is about two miles west of town. There are taxis available at the airport, and if you plan to stay in Dillingham, there are several hotels and bed & breakfast establishments. There are also several restaurants, grocery stores, and outdoor supplies stores in Dillingham. Telephone numbers and addresses for these merchants are available from the Dillingham Chamber of Commerce by telephone (907-842-5115), email: dlgchmbr@nushtel.com. Access out of Togiak and into Round Island is limited by tides, weather, daylight and transporter availability. It is likely that an overnight stay in Togiak coming and/or going may be needed depending on these factors. Another option is by floatplane from Dillingham to meet the transporters boat at a location in Kulukak Bay, and then by boat to Round Island. You will need to make your own arrangements to get to Round Island or other islands within the sanctuary from Togiak or Dillingham as the ADF&G does not provide transport to the Sanctuary. Access to the islands from Togiak or Dillingham can be accomplished via commercial or private vessels. However, any vessel traffic and visitor access to Round Island or the waters within 3 NM of Round Island must be pre-authorized and follow the notification and vessel approach conditions of the permit. The permit requires that you contact staff on Round Island prior to 9:00 a.m. on the day you plan to travel to Round Island (MVHF Ch. 7). You must stay farther than three miles from the island except when you approach Boat Cove within the designated access corridor after contacting Round Island staff and receiving authorization. If you go with a commercial operator, the operator will stay within the access corridor and secure permission to land prior to arrival at the island. If you are using some other form of transportation to get to the island, make sure you let us know when you plan to go out there. We will work with you to coordinate a radio-schedule for relaying weather information and establishing arrival/pick-up times. There are no locations to safely anchor or moor a vessel during your visit; consequently vessels must move to a location outside of the sanctuary after dropping off any visitors. You should also make reservations well in advance of your visit and contact transporters as your travel dates approach to reconfirm and ensure everything is in place to go. Life in bush Alaska can be hectic and communication is often difficult. Local inhabitants depend on the land and resources for food and income; and their availability is often dependent on when fish, wildlife or plants need to be fished, hunted or gathered during the season. If you cannot immediately make contact with a transporter, keep trying, they will usually get back to you in time. The following list provides information on transporters who have obtained, or indicated they plan to obtain authorization from the Alaska Department of Fish and Game to transport visitors to the sanctuary. This list should not be considered a recommendation of any particular operator. The Department of Fish and Game cannot endorse nor guarantee the service of the operators listed below. Nor should it be considered a complete list, currently commercial operators specializing in transport to Round Island are fairly limited, however, other transporters may be available. For information on rates and schedules contact these or other transporters of your choice directly. Transporters not listed will need to obtain an transport access authorization prior to providing transport to Round Island. Please remember that it is your responsibility to contact air carriers and transporters to make your own travel arrangements. All arrangements made between transporters and permit holders do not involve the Department of Fish and Game. Currently we know of one commercial operator that plans on providing guided trips and transportation to Round Island. * The maximum number of passengers is restricted by the total weight of the vessel’s load (passengers plus gear). You can also contact the City of Togiak @ 907-493-5820 to inquire about commercial operators who may be available to provide transport to the island from Togiak, AK.